Mercedes tuner Brabus is bringing a few cars to the Frankfurt motor show, but instead of fire-breathing, gas-drinking supercars, they're electric. The company that brought us the 738-hp Brabus SL600 and the 788-hp Brabus S600 R is turning its considerable tuning powers to low-emission luxury cars--for now. The second is an all-electric version of the sedan with four wheel-hub motors and 2,360 lb-ft of torque at the wheels. 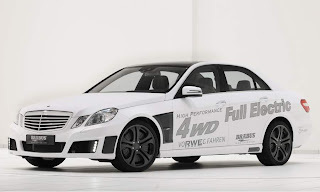 The second car from the company will be a 320 kW (429-hp), 3,200 Nm all-electric vehicle based on the E-class sedan. It will come with a range of 217 miles, according to the company. The Brabus High Performance 4WD Full Electric will have four motors at the wheels making 80 kW and 800 Nm of torque each. The fully electric E-class will be a heavyweight at 2,200 kg but will benefit from electric motors that provide 100 percent of torque at zero rpm. The sprint to 60 mph will take less than seven seconds, according to the company. 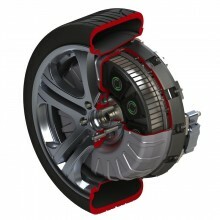 But because of the wheel-hub motors' maximum speed of 2,000 rpm, top speed will be 137 mph. There are benefits to putting motors at each of the wheels. Besides eliminating significant drivetrain loss, the all-wheel-drive system can disperse torque even more efficiently with the electric motors during slippery conditions and maximize brake regeneration. Charging will take 1.5 hours with the 380-volt charger and about five hours with the 220-volt unit. The cars are prototypes, so no prices have been announced yet. The company does say, however, that both could be put in to low-volume production in the future.